SPOILED: Paul Mayer and John Didge with snapper from Corio Bay. 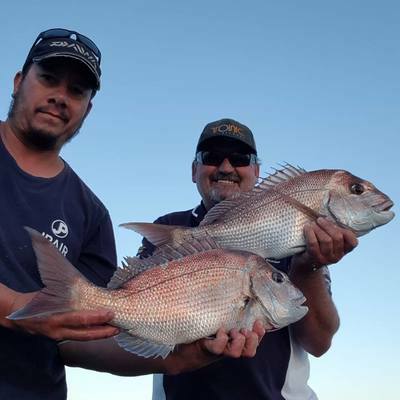 The past week again shone the fishing spotlight on the Alcoa spoil grounds, with great numbers of snapper to around 5kg boated. Among those to do well were Paul Mayer and John Didge who managed numerous snapper while casting soft plastics during an afternoon. Another angler reported catching snapper after finding schools of fish on the sounder in 6m to 7m of water then dropping soft plastics like the Gulp four-inch Nemesis in Nuclear Chicken colour straight down while his mate caught just as many on pilchard baits. Corio Bay’s inner-harbour held smaller snapper and also fished well for flathead right across the waterfront and into the grammar school lagoon. The Barwon River estuary produced mulloway throughout the system, with fresh squid the preferred bait. Mulloway were also caught on pilchards and live mullet, while big silver trevally remained present along with bream and King George whiting. Bluefin tuna, kingfish and mako sharks were caught offshore along the coast. Stuart Leschke hit Port Fairy for a session in 40m around Julia Percy Island. Trolling small white skirts resulted in a catch of two fish of 28kg and around 15kg. Anglers chasing makos can expect results with fresh caught slimy mackerel or a big salmon fillet used in conjunction with a strong berley trail. Some great bream fishing was enjoyed at most of the popular locations, like the Glenelg River at Nelson and the Hopkins River in Warrnambool. However, a number of reports indicated that the Curdies River around Boggy Creek was a standout, with anglers banking bream to 1.4kg using scrub worms or Bass yabbies for bait and fished hard against the weedy edges or near hanging branches. Camperdown made for a popular destination, being central to Lake Purrumbete and Lake Bullen Merri. Both lakes fished fantastically for trout in excess of 2kg. Fishing the weed edges at Lake Purrumbete in the early mornings returned big brown trout, while anglers after a feed of redfin had no drama filling buckets with fish taken on scrub worms or lures. Next door, at Lake Bullen Merri produced brown and rainbow trout long. Chinook salmon were caught on pilchard fillet fished near the bottom in around 10m of water while using a berley of finely diced pilchard offcuts.